After the fallout clears, vinyl still stands. San Francisco artist Huck Gee resurrects Dunny with 13 post-apocalyptic designs featuring zombie hunting ninjas, cyborg geishas, evolved apes, mecha troopers, feral foxes, radiated rhinos, and super fly copter kids. Hyper detailed sculpts and crazy complex accessories push the boundaries of 3 inch vinyl to create characters that are built to survive - even when nothing else does. FIRST COME, FIRST SERVED. STOCK IS LIMITED. Guns don't kill people... lazers do.1984: the Olympic Games are held in LA, President Reagan runs for re-election, the AIDS epidemic runs rampant, and underneath it all, the secret Zombie War rages. One secret soldier is rescued from the fray, his arm gone, but his spirit strong. He is given an experimental lazer prosthetic and hired by the CIA to continue his fight against the forces of evil. He fronts as a dancehall nightclub owner from Trinidad, though in truth, he is a badass Jamaican keeping the world safe from vampires and monsters, while partying hard and tweeting. Dunny went on holiday to Chernobyl, which turned out to be a bad idea. GID and semi-translucent, Meltdown Dunny is an 8 inch vinyl glowing ghost featuring dead eyes and what’s left of his pet fish. Only 600* of each color edition survived. Pink Edition is sold through specialty toy stores here in the US. Meltdown Dunny’s radiation vacation begins February 14. We are stoked to get these limited 8" Shadow Friend Dunny by Angry Woebot. We will be releasing them on Thursday December 6th at our Pearlridge AND Ala Moana shops when we open. We only have a limited amount available. Good luck and here's more info on this special release. Shadow Friend is the perfect playmate. He follows you wherever you go, playing right along. As a backwards twin to the original Woes design by Angry Woebots, Shadow Friend takes all of the gushy, “I heart you” feelings associated with mammoth cuddle monsters, and replaces them with an awkward nervous fear. 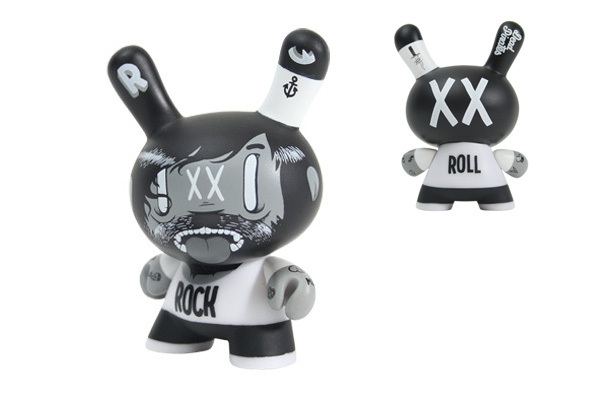 Inspired by his 3-inch 2Tone Dunny, this is a darker version of his iconic stressed out giant panda. Showing off its latest catch of speared fish, the 8-inch Shadow Friend Dunny intimidates with hot pink beady eyes and a one-fanged snarl. Representing the number of Giant Pandas left in the wild, 1000 Deep is printed on the back of Dunny’s head, and black skull printed on its chest, a symbol of the species struggle to stay alive. 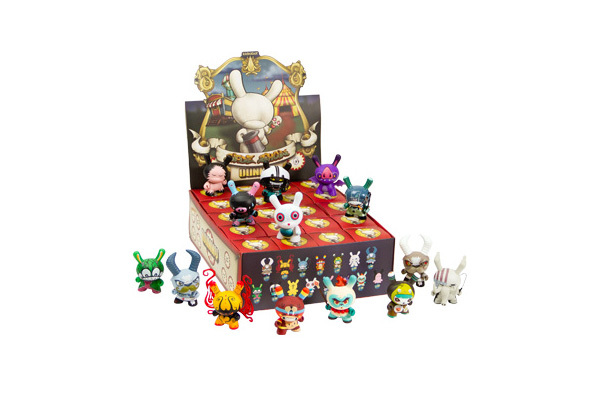 Like their fuzzy counterparts, Shadow Friend Dunnys have limited numbers – only 1250 are available. December 6. Resurrected from Dunny Series 1, Tristan Eaton's Gold King is back and bigger than ever to celebrate 10 years of Kidrobot. Wearing a colossal Dunny crown, his royalness is 20 inches of sleek metallic gold vinyl, leaving Dunny's form unobstructed and pure.Gold King is a limited edition of 300. In four alluring color editions - Teal, Black, Orange, and Purple - the Lovebirds by Kronk are the most affectionate animals to cozy up to vinyl. Packaged individually in an artist-designed box, each figure stands on its tail with its feet in the air, ready to connect with (or push away) any potential partners. Stellar on their own but perfectly complete when mated, the Lovebirds are both half and whole. Like yin and yang, macaroni and cheese, ice skaters and spandex - you will enjoy just one, and fall in love with two.